It gives me great pleasure to nominate Dr Nicholas Nickoletopoulos from the United States of America for the Professor Marian Schneider Memorial prize, a widely known person, popular and respected for his activity for development of the world wire industry. Dr N. Nicokletopoulos graduated from McGill University Montreal, Quebec in Canada in 1999 as a Master of Engineering (M.Eng). In 2001 he graduated as a doctor in the field of metallurgical engineering from the same University. Nicholas Nickoletopoulos is general manager of Sivaco Wire Group and Ifastegroupe in Canada. It is worth to mention that Sivaco Wire Group includes three companies Sivaco Quebec(Marieville), Sivaco Ontario (Ingersoll), Sivaco Galvacor (Quebec City). Ifastegroup including among others Infasco (Marieville, Quebec), Galvano (Beloeil. Quebec), Infasco Nut (Mississauga, Ontario. Recently since January 2008 till January 2010 he worked also as Director, Marketing, Quality and Technical Services at Ivaco Rolling Mills Earlier in this Company he worked in various capacities for 13 years. In period 1994-2004 he worked there at position of Customer and Product Development Engineer and in period 2004-2008 at position Manger, Quality, Field Services and Field Product Development. WAI’s president Nicholas Nickoletopoulos is currently serving his second term as a member of the Board of Directors, and is a member of the Executive Committee. He is member of Wire Association International since 1997, he was member of Technical Council in period 2002-2005 and member of Ferrous Management Committee in period 2004-2005. Since 2006 he is chairman and co-chairman of Conference Programming Committee and since 2007 he is a member of Oversight Committee. In 2010 he served for WAI as Second Vice President and in 2011 he served as First Vice President. Beyond his activity in Wire Association International he is a member of several associations among them: ASM International –American Society for Metals , ASM Montreal Chapter – Executive Committee Member in period 2000-2005, CIM –Canadian Institute of Mining, Metallurgy and Petroleum in period 1987-2004, CINS-Canadian Institute of Neutron Scattering: Atomic Energy Canada member since 1998. He is also very active for West Island Greek Orthodox Community being a member of Executive Committee and member of Fundrising Committee since 2009. He has been a member of the Professional Engineers of Ontario since 1997. – Horace Pops Medal Award for best paper entitled: The Mobile Impact Tester for Cold Heading Research at Ivaco Rolling Mills – Pittsburgh, Pennsylvania, June 2008. Publications of N. Nickoletopoulos as author or co-author attainment makes 22 articles mainly in renowned periodicals in the fields of metallurgy and materials engineering, such as: ISII International, Material Forming Processes, Materials Science Forum, Wire Journal and Proceedings of International Conferences (see enclosed list of publications). 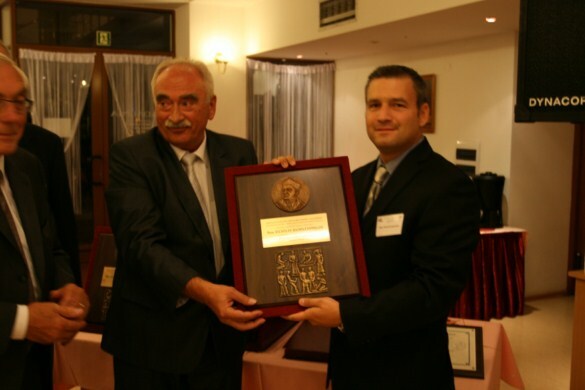 The Board of Poland Chapter of Wire Association International has awarded Dr.Nicholas Nickoletopoulos with Schneider Memorial Award in recognition of his outstanding contribution to the advancement of the wire industry. We highly appreciate among others your many years of cooperation with scientists from Czestochowa University of Technology in Poland founders of Poland Chapter which has brought to successful projects in the range of TRIP steel for wire rods and wires. Those projects were base of Ph.D for Maciej Suliga and recently habilitation of Dr. Sylwia Wiewiorowska as well as joint papers presented at WAI’s events and in Wire Journal. To conclude my speech I would like to make a statement that Dr Nicholas Nickoletopoulos President of Wire Association wholeheartedly deserves the Professor Marian Schneider Memorial Award. Previous VII Międzynarodowa Konferencja Ciągarska 02-04.03.2017r.